When teenager Jennifer Maidment is murdered and her mutilated body is found dumped by the roadside near Worcester, West Mercia Police have little to go on and call in the support of criminal profiler, Tony Hill. Hill has time on his hands since back in Bradfield – the Sheffield/Bradford fictional location where Hill lives and usually plies his trade – his friend and lodger, policewoman Carol Jordan has been banned from using Hill’s services. Hill has other personal reasons for thinking that an excuse to go to Worcester is very timely too. When a teen-aged boy goes missing on Carol’s patch, it’s only a matter of time before his mutilated body will be found and another boy will be reported missing. With Tony in Worcester and Carol banned from talking to him, neither knows that the other is involved with a similar case. Suddenly young people across the country are disappearing and the only thing that links them appears to be an on-line social networking site. Each of the victims has been in contact with a mysterious member who claims to know their secrets – secrets so confidential that even the children themselves don’t know them. Of course we as readers have the advantage of the whole picture – Tony and Carol each have only their own parts of the puzzle and neither knows what the other is working on or they’d be quicker to get on the scent of the killer. As readers, we must wait like frustrated pantomime-goers screaming out “behind you” as they move along without the benefit of the connections that quickly become apparent to us as observers. As child after child is reported missing, can Tony’s knowledge of human behaviour and Carol’s old fashioned policing skills combine to catch a serial killer whose motives are so hard to fathom? What seems to make the loss of these children so much more poignant is discovering just how much each of the parents adored their child. All are only children, several conceived only after many years of trying and one born to a lesbian couple. With so many heart-broken and devastated families impacted by the loss of their children, there’s a parallel theme of less conventional and much more dysfunctional family affairs running in the background. In the previous book in the series (Beneath the Bleeding, 2007) we were introduced to Tony’s horrible mother and discovered her plot to swindle her only son out of his inheritance. In Fever of the Bone, it’s time for Tony to make some hard decisions about that inheritance and confront the issues that led his father to abandon him before he was even born and for Carol to uncover just how far Tony’s mother would go to get what she wants. 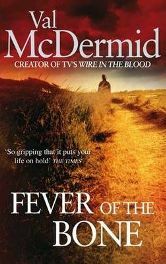 Fever of the Bone was released in 2009 and is the sixth of Val McDermid’s books to feature the sleuthing team of Jordan and Hill. The pair were first introduced by McDermid way back in 1995 in ‘The Mermaids Singing‘ and have been used as the inspiration for the TV series The Wire in the Blood. After 14 years of buying and reading McDermid’s books, I’ve come to view Carol and Tony as old friends. Of course their lives have changed since we first met them – Carol is now a Detective Chief Inspector and runs a special team that investigates major incidents and comprises a group of well-painted characters whom we’ve got to know over the previous books. Unfortunately Carol’s new boss sees the team as less of a feather in the cap of the police force and more as an expensive indulgence that’s a drain on his budget. Tony’s profiling skills are now so well established that he’s helping the Police training colleges to train up a new generation of in-force profilers who will one day do him out of a job. Both are older, occasionally wiser, and even more damaged and down-beaten by years of working at the coal face of human depravity. Carol’s still drinking too much, Tony’s still living in his own private world of introspection and even after 6 volumes we’re no closer to getting a romance out of the pair of them. I loved this book – which was not a surprise as McDermid has never written a book I’ve read and not adored. She’s a master artist when it comes to revealing just a little bit more to the reader than she does to her protagonists. If we pay attention and stay sharp, as readers we should always be able to keep a half-step ahead of the police. I had the connection between the victims worked out relatively early – certainly I think earlier than I was supposed to – but the killer was still a mystery up to the moment they were caught red handed. I had half the reason for the killings worked out before the ‘reveal’ but not the actual detail of the twist. I hate nothing more than ploughing through hundreds of pages to discover at the very end that there was absolutely no way that anyone could have worked out the plot because the writer has stuck a silly unconvincing twist on the end. I also loved the way that the novel integrated very contemporary themes around internet security and social networking with examination of how the ‘family’ has changed in recent decades and the contribution of advances in medicine and genetics to those changes. No doubt knowing that her regular readers have come to love the two characters at the heart of this series, she wisely shied away from the temptation to dangle a ‘will they won’t they’ carrot of romance over our heads and instead offered us deeper emotional developments in the characters of both Jordan and Hill, showing us Tony battling his demons to come to terms with getting to know about the father he never had and giving us Carol fighting like a mother-cat to defend him from his evil mother. McDermid is just so consistently and reliably brilliant that money spent on any of her novels is a sure bet for a good read. Long may that continue to be the case. No Comments on "The Fever of the Bone"